A companion for navigating the currents of your voice, inner knowing, and deeper stories. With 25 exercises to deepen your writing. After purchasing, you'll be sent a private link to download Open Waters. The download is a PDF that's easy to view on a computer or mobile device, as well as easy to print and carry along, wherever your writing journey takes you. Our own writing can be our best teacher. I say that a lot at Voice & Vessel, especially as I hear questions like: What should the creative process look like? How do I know when I'm ready for a certain project, or if my writing is ready to go out into the world? What does it look like to stay with a story and help it unfold? How do I do the deeper creative work... and how do I know if the idea I have is one that "deserves" a deep dive? These questions speak to a tricky challenge many of us creative spirits face. We don't know what we don't know. We want the map. We want a good process. We want an authority to name our story worthy and our voice important. We imagine writing as a secret labyrinth that we just haven't cracked yet. In a world that values "hustle," we want to be sure we aren't "wasting time" by writing words that won't matter in the end. Or there are certain subjects we struggle to write about, because we decide only people with a certain degree, or certain field expertise, should write about them. Yet our stories keep leading us to those subjects... and our voice sparks whenever we approach. It's as if our curiosity keeps outrunning our sense of permission. We end up in open waters, without a shore to hug or a lighthouse to ask for approval. Every time we write, we begin this dance. And I believe it's in these open waters that our writing teaches us the unexpected. It leads us out, it drags us down, and it brings us to the surface with ideas we never knew to seek. When we return to the shore, we have more than new stories. We have a new idea of what the creative process is, on our own terms. We have a deeper sense of how we do the work of writing itself. We've witnessed firsthand that lighthouses can point out rocks, but they have no way to teach us how to swim around them. That's our work, and it will look different for each of us. Open Waters is a companion for this curious and ever-shifting journey. 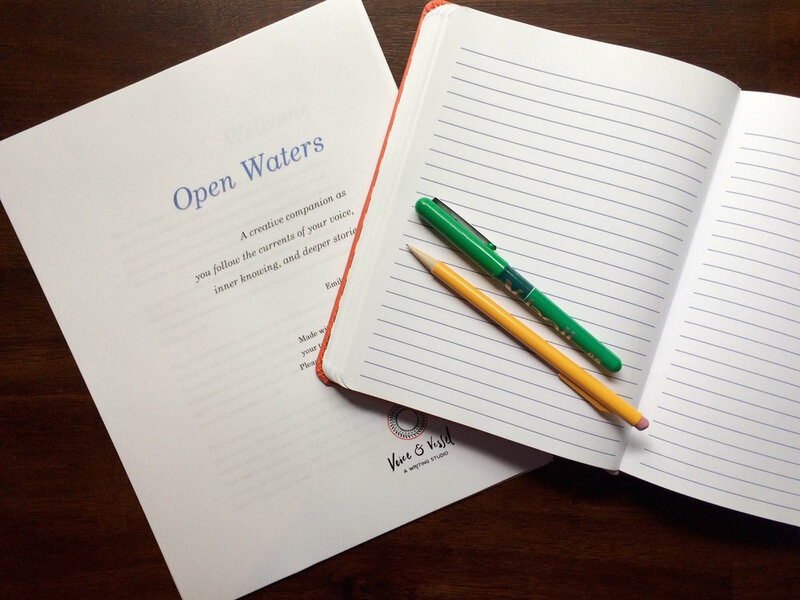 It's a guidebook of messages, creative prompts, and writing exercises to call you into your open waters. It's a tool to make a space where you can wade, float, and dive deeper into your writing life. I'm Emily Stoddard, a writer and the founder of Voice & Vessel. Open Waters reflects many of the passions, challenges, and practices that I've found in the deep end of the creative life. My writing has appeared or is forthcoming in Tinderbox Poetry Journal, An Alphabet of Embers, Watershed Review, Hermeneutic Chaos, Menacing Hedge, and elsewhere. As a Certified Leader of the Amherst Writers & Artists Method, it's an honor to hold a space for people of all backgrounds and journeys to connect with their voice. Learn more. Have we written together before? If you've been a part of one of Voice & Vessel's workshops in Grand Rapids or online, you might wonder what makes Open Waters different. Open Waters is different in format and intention. It's a one-time download, rather than a multi-week journey. My hope is this will be a guide and reflection tool you return to again and again, whenever you're facing the open (and sometimes intimidating) waters of your creative life.